Ben Bernanke delivered a speech Friday where he further developed his global saving glut (GSG) hypothesis. This view holds that the reason for the low long-term interest rates in the United States during the early-to-mid 2000s was that desired saving vastly exceeded desired investment in emerging economies. Consequently, capital flowed from these countries to the U.S. economy and pushed down long-term interest rates. The cheaper credit in turn fueled the U.S. housing boom. Based on a new research paper, Bernanke extends his GSG hypothesis by considering the type of assets desired by these emerging economies as they invested in the U.S. economy. He shows that investors from these countries, as well as from Europe, had a strong appetite for AAA-rated assets which were in short supply elsewhere. Given the limited supply of Treasury and agency securities, the U.S. financial system responded by transforming risky assets into safe assets. Mr Bernanke’s goal, I think, is to strike another blow in the long-running argument about whether it was foreign currency manipulation/excess savings or bad US monetary policy that caused US interest rates to be so low in the middle of the last decade and thus stoked the housing bubble. But let's give Bernanke benefit of the doubt. Maybe he is just extending his GSG hypothesis and is not trying to absolve the Fed of responsibility for the housing boom. If so, it would do a world of good if he would actually address the tough questions that skeptics like me have about the GSG hypothesis. In case he is reading, here are the questions. (1) Wasn't some of the excess saving coming from the emerging economies simply recycled U.S. monetary policy? As Bernanke's speech suggests and as acknowledged by other Fed officials including Janet Yellen, the Fed is a monetary superpower. It controls the world's main reserve currency and many emerging markets are formally or informally pegged to dollar. Thus, its monetary policy is exported across much of the globe. This means that the other two monetary powers, the ECB and the Bank of Japan, are mindful of U.S. monetary policy lest their currencies becomes too expensive relative to the dollar and all the other currencies pegged to the dollar. As as result, the Fed's monetary policy gets exported to some degree to Japan and the Euro area as well. In the early-to-mid 2000s, those dollar-pegged emerging economies pegged were forced to buy more dollars when the Fed loosened monetary policy. These economies then used the dollars to buy up U.S. debt. This channeled credit to the U.S. economy and pushed down interest rates. To the extent the ECB and the Bank of Japan were also responding to U.S. monetary policy, they too were acquiring foreign reserves and channeling credit back to the U.S. economy. Thus, the easier U.S. monetary policy became the greater the amount of recycled credit coming back to the U.S. economy. Now this doesn't mean all of the foreign reserves buildup was due to U.S. monetary policy. There are both precautionary and mercantilist reasons for the accumulation of foreign reserves. U.S. monetary policy affects foreign reserves buildup through the latter one. The question, then, is how important was the mercantilist motive? The two figures below suggest it was and still is sizable. 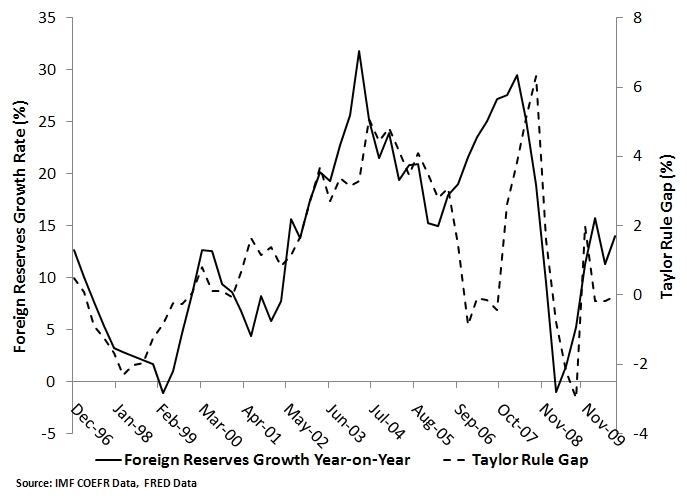 The first figure shows the year-on-year growth rate of global foreign reserves along with the Taylor rule gap. 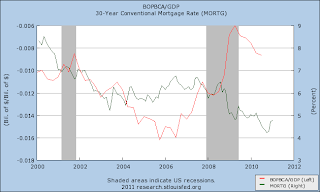 This gap is the difference between the Taylor-rule prescribed federal fund rate and the actual federal fund rate. 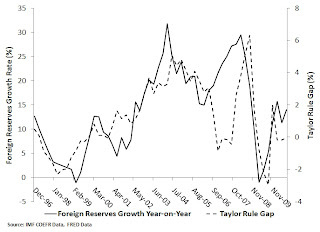 In other words, the Taylor rule gap provides a measure of the stance of U.S. monetary policy. This latter figure indicates that about half of the foreign reserves buildup can be tied to the stance of U.S. monetary policy via the mercantilist motive. Now this is not conclusive evidence, but at a minimum it should give GSG supporters pause. It seems that a sizable portion of the saving glut was simply recycled U.S. monetary policy. As Barry Ritholtz notes, this drop in yields caused big problems for fixed income fund managers who were expected to deliver a certain return. Consequently, there was a "search for yield" or as Ritholtz says these managers of pension funds, large trusts, and foundations had to "scramble for yield." They needed a higher but relatively safe yield in order to meet their expected return. The U.S. financial system meet this rise in demand by transforming risky assets into safe, AAA-rated assets. The Fed's low interest rate policies also increased the demand for safe assets for hedge fund managers. For them the promise of low short-term interest rates for a "considerable period" screamed opportunity. As Diego Espinosa shows in a forthcoming paper, these investors saw a predictable spread between low funding costs created by the Fed and the return on higher yielding but safe assets. They too wanted more AAA-rated assets to invest in so that they could take advantage of this spread that would be around for a "considerable period." Here too, the U.S. financial system responds by transforming risky assets into safe assets. (3) Why doesn't the GSG hypotheis fit the data after 2005? If the huge CA surpluses (which reflect the global saving glut) coming from the emerging economies did, in fact, lead to the lowering of long-term rates in the U.S. economy, which in turn fueled the housing boom, why did long-term rates stop falling in 2004 and start rising in 2005? As the figure below shows, the U.S. CA deficit as a percent of GDP (red line) falls through 2006 and remains large through early 2007. 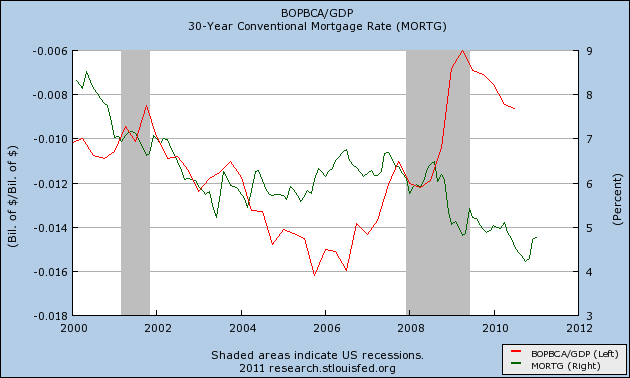 The 30-year mortgage rate, on the other hand, stabilizes in 2004 and starts increasing in 2005. 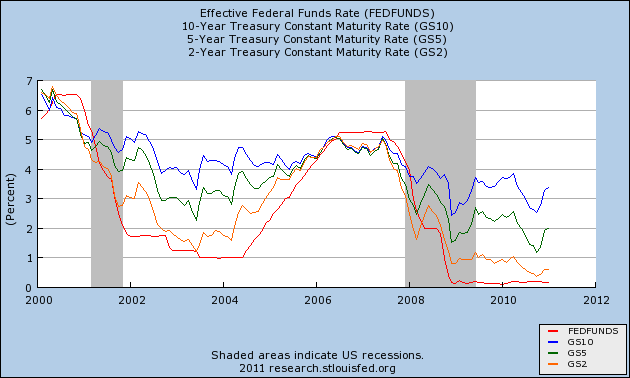 How is it that the saving glut could fuel low rates in the early-to-mid 2000s but not thereafter? (4) Was the U.S. economy really a slave to the emerging economies during the early-to-mid 2000s? The GSG hypothesis has an underlying theme of inevitability. The implicit message is that the U.S. was destined to be a profligate spender because of the huge CA surpluses in Asian and oil-exporting countries. Really? Why couldn't monetary or fiscal policy have tightened during this time? Were U.S. policymakers truly constrained by the whims of foreign savers? This inevitability theme seems strange now that these same countries are complaining about the uneven impact of QE2 and begging the Fed for mercy. So what is it: is the U.S. economic policy a slave to the emerging economies or are the emerging economies a slave to the U.S. policy? I look forward to hearing Chairman Bernanke's response to these questions. Update: The Taylor rule Gap equals the Taylor rule federal funds rate minus the actual federal funds rate. Thus, a positive value for the gap means actual federal funds rate is below Taylor rule value or monetary policy is easy. The Taylor rule uses a 2% inflation target, the CPI inflation rate, and the Laubach-Williams output gap measure. "The U.S. financial system responded by transforming risky assets into safe assets." Is this ironical--the U.S. financial system fraudulently represented risky assets as safe--or does it mean that the U.S. system was able to separate out some of the riskiness so as to offer safe tranches to developing-country investors, the risky tranches being sold to domestic investors (on terms attractive enough to appeal to the latter)? "In the early-to-mid 2000s, those dollar-pegged emerging economies . . . were forced to buy more dollars when the Fed loosened monetary policy." "Forced?" If a foreign country pursues a tighter monetary policy than does the Fed, its export industries will suffer, but its consumers of imports will benefit (in the short run, until equilibrium is restored). If these effects don't cancel out politically, it is (I suppose) because the exporters have more political influence than the importers, perhaps in part because of widespread mercantilist preconceptions. "It seems that a sizable portion of the saving glut was simply recycled U.S. monetary policy." Yes, but only *given mercantilism*. The idea that "the U.S. economy [was] really a slave to the emerging economies during the early-to-mid 2000s" (and if so, it must still be a slave) is like the plaint that monetary policy is powerless at the zero interest-rate bound: it shields the Fed from criticism. Yes, I shouldn't have said "forced", but my point is that given mercantilism it seems obvious that some of the saving glut is just recycled U.S. monetary policy. Why won't Bernanke admit it? Your answer about protecting the Fed seems to be the best one. Do you think this is a conscious thing or is Bernanke unconsciously getting caught up in defending his institution? I would like to see these questions addressed to him by Congress. Sorry, sir, but I´ve red the speech and I don´t think Bernanke is excusing the FED. He says very clear that there were huge fault of regulation and supervision. We have red a different paper, perhaps? My opinion is that global imbalances were a source, but not the cause, of the crisis. the cause was, as Bernanke says, The MBS and all the derivatives that propitiated the highest leveraging in the history. I have already responded to the Woodford paper here. How do you specifically address the questions raised in the post? Just noticed multiple typos in my post. They have been fixed. 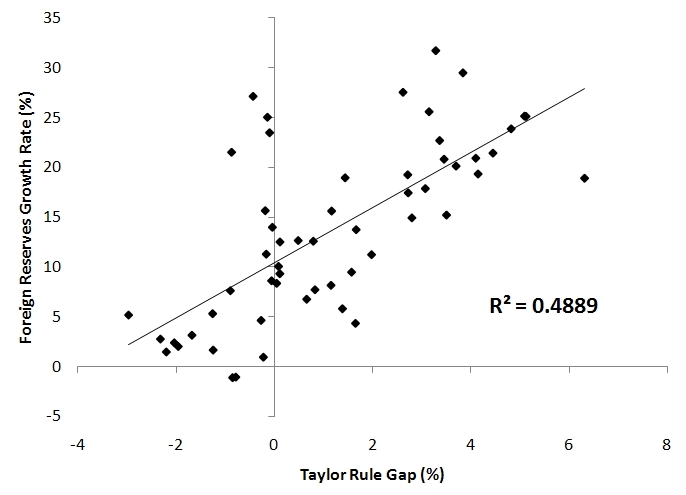 I provided an update that better explains the Taylor rule gap. 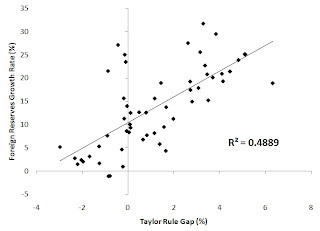 I find measures of the "Taylor Rule Gap" to be very misleading. John Taylor himself had a chart showing the Gap this in the WSJ earlier this year. It is misleading because it can appear to the reader as though the Fed “should” have held interest rates higher by an average of about 250 bps at each and every point in time from 2002 to 2007. But if the Fed had been tighter in 2002 output and inflation would have been much lower in 2003 and 2004 necessitating much lower rates (if the Fed had literally stuck to this path implied by the Taylor Rule rate the economy would have ended up in a deflationary depression). I realize that the "Gap" measure is meant to be ‘static’ in the sense that that it is showing the ‘Taylor Rule’ rate taking output and inflation as given in each quarter. But I think it leads readers to the conclusion that the Fed was much easier during this period than it actually was. Core inflation only exceeded the Fed’s implied target in 2006 and 2007 - and even then only modestly. And TIPs expectations were very stable from the end of 2003 until September of 2008. So I would say the Fed’s policy was roughly appropriate or perhaps just slightly too easy from 2002 to 2007 (and much too tight thereafter but don’t get me started on that). It does seem self-serving on the part of the Fed. But what do you say to Caballero's comment that tight monetary policy in the 1990s didn't prevent low long-term rates back then, the so-called conundrum. 1 "He shows that investors from these countries, as well as from Europe, had a strong appetite for AAA-rated assets which were in short supply elsewhere. The U.S. financial system responded by transforming risky assets into safe assets." Mistake: Bernanke said there were not emerging countires (wich prudently bought treauies) but eurpean banks, that bought MBS. 2 "Note, though, that the GSG hypothesis places no culpability on the Fed. Instead, blame is placed on the failings of the U.S. private sector and foreigners who save too much." wrong: Bernanke said that ther is a culpryght in FED, for not to do well its regulation $ supervision work. what I see is an a priori anti Bernanke position, perhaps justified, but in any case not adjusted, or far away, to his words. Once more I took the opportunity to write a post on the subject you broach! But the take is very different. Yes, I should have been more careful in noting that because emerging economies were for the most part buying up Treasuries and agencies, it left little else for other investors and thus the financial system responded by making safe assets out of risky ones. I made a small change in the post to better reflect this point. Note, though, that China and other parts of Asia did buy up some of private sector securities. Chart 2 in the Bernanke et al. paper shows that about 22% of the Chinese assets were in private U.S. assets. On the Fed's role, yes Bernanke has acknowledged the Fed could have done more on the regulatory front, but he ignores the questions I raise in this post. DB: I'm so glad to see you are now a Post-Keynesian! The textbook argues that savings must occur first before investment can occur—and since the poor Chinese happen to be good savers, while the rich Americans are lousy savers, the financial flows went from China to the USA. So the US crisis is all China’s fault. 4. Some of these reserves were used to purchase US assets, including Subprime bonds but also government bonds, equities, and other financial assets around the world. So the problem began, not with Chinese saving, but with American lending. The huge foreign exchange surpluses accumulated by the BRICs, Japan and to some extent Europe began in the profligate lending of the American financial system during its latest and greatest Ponzi bubble. They are a symptom of the problem, but not its cause. That Post-Keynesian excerpt is not too different than the David Laibson and Johanna Mallerstrom paper that argued the saving from Asia responded to demand for funds in the U.S. economy. I posted on it here. Bernanke needs to wrestle with this paper too. On your previous comment, you mentioned Caballero's question about low long rates before Fed easing. Where does he say that? He also has a paper entitled "The Pretense of Knowledge" echoing Hayek, that really none of our extant models can get to grips with this extraordinary event. Everyone - you, me, the monetarists, the Austrians, the Minskyites - has their favorite "prejudice" about what happened and searches for confirming evidence, ignoring anything that doesn't fit. I find Bernanke's argument regarding global savings gluts to be compelling. I suspect the challenges of the future will be to stimulate the economy even as interest rates stay near zero bound. In general, I am unsympathetic to arguments that "the Fed made me do it." Rings like "The bartender got me drunk." The housing bubble, and perhaps the dot.com bubble, are fevers brought on by clever sellers, and some trends they can exploit. Bubbles happened before the Fed. If we have to keep interest rates up high enough to break every fever, we will put a monetary noose around our necks. The Japan story is the compelling story. The price of obtaining zero inflation and no fevers is a 30 years recession (I am assuming that Japan has another eight years of deflation ahead of it, as expected by bond traders). And Japan might keep sinking even after that. The war against inflation is yesterday's battle. Deflation is the danger now. David, I´m just now reading Rajan´s "Fault Lines", and I become more convinced of your arguments. Perhaps I was missing the complete landscape of the question. Michael Pettis has written about/defended the GSG before as well. 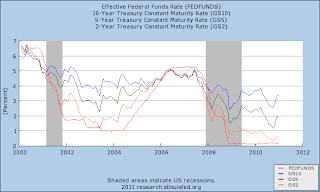 Is the U.S. Treasury Department Undermining QE2?